When it comes to protecting your horse from over-reaching and interfering, the Dy-No Turn Bell Boots offer superb protection, durability and comfort for your horse. The boots are water repellent and stain resistant, made to withstand daily training sessions in tough conditions. Each boot is made out of 2520 denier DynoHyde material with a dense shock-absorbing center and soft jersey lining. 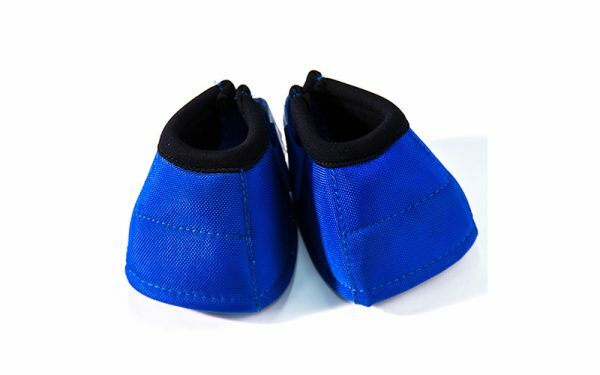 The double hook-and-loop closures and contoured fit are assurance of a long-lasting and secure method to keep the boots in place. Listen to Clinton explain why he uses bell boots when working with his horses in this video. Colors: Black, Blue, Red, and Purple. Black, Blue, Red, and Purple boots are available in sizes Medium and Large. Black boots are also available in Extra Large.